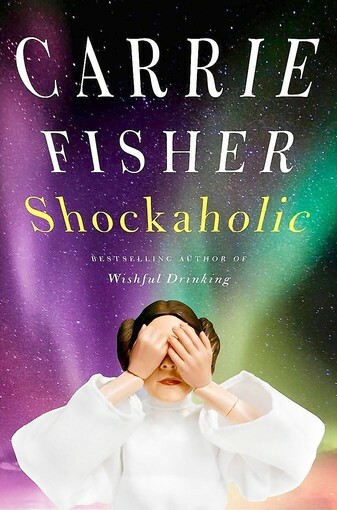 Thanks to the Seattle Public Library I’ve finally had a chance to read Carrie Fisher’s new memoir, Shockaholic, that came out in November. For those of you who don’t know, Carrie Fisher (known primarily for her role as Princess Leia in Star Wars) is amazing. Not only is she a celebrity living openly with bipolar disorder, she has struggled with addiction, a bizzare childhood, and any number of roadblocks that most average folks wouldn’t even dream of. She is also a wonderful comedian, which is instantly apparent in her writing. Fisher recently underwent Electroconvulsive Therapy (also known today as ECT, previously known as “shock treatment”) to combat her severe depressive bipolar episodes, which is where the title of this current memoir originates. I’ve been researching ECT on and off for a while at the request of my psychiatrist. I’m not able to take most traditional medications for bipolar disorder because I have an extremely sensitive body chemistry, so it is possible that I may be considered a perfect candidate for ECT at some point. Carrie Fisher discusses both the benefits and drawbacks of her treatment, in addition to the interesting situations the combination of her celebrity and bipolar disorder have gotten her into, and how she coped. After that, she muses over her relationship with her father. Her last memoir, Wishful Drinking, was great, but I couldn’t help but wish it was more organized. In my opinion, Fisher’s writing mimicked a manic episode, complete with tangents galore. I was really hoping her next piece would be a little more organized, and that’s exactly what I found! Shockaholic is great! It is everything I wanted and more. Thoughtful, insightful reflection, both deep and honest, and the perfect amount of humor. I would highly recommend this book to any Fisher fan or person diagnosed with bipolar disorder. Please keep in mind though that there is some dark humor (necessary, considering some of the dark subject matter), and the topic of death is a common theme throughout, so consider yourself forewarned. These elements, however, only contribute to some deep and extremely frank, hilarious accounts from a bipolarite. I love it! This entry was posted in Bipolar and tagged Bipolar, bipolar celebrities, books, Depression, ECT. Bookmark the permalink. Tangets are marvelous, especially if you can ping back to the original subject that set off the tanget(s) 🙂 They’re underrated. Organization – overrated, bah. Plus tangentalism is one of the great characteristics of Bipolar anyway. I’d say the majority of humor dark or not comes from pain. Dark humor is blatantly from pain. Other humor doesn’t appear to be from hurt or pain, but deep down at the core I think it is. There is an audio-book version, so I’m surprised you haven’t seen an audio version on your kindle. I know they have it at the Library here! And I agree with you about humor. I was just thinking about that earlier today!